Moving beyond gaming and entertainment implementations, there’s a rapidly growing need for almost every enterprise to spend time thinking about how AR can transform their business. Apple’s focus on augmented reality (AR) is impacting far beyond the gaming and entertainment industries, and the AR business case is growing as enterprises continue to seek out new ways to deploy the tech to reach customers. Since Apple introduced ARKit, a slew of high-profile apps such as those from IKEA (and more recently, Curry’s) have shown how retailers hope to use the technology to reach consumers. Consumers benefit from the chance to see what products might look like in their homes, while retailers gain from developing closer and more constructive relationships with consumers. This reflects a shift in retail philosophy — it’s no longer enough just to sell products. Today’s retail environment is one in which retailers and consumers become allies to effectively identify and meet people’s needs. In a sense, this is a triumph for Apple’s own retail store philosophy, which correctly identified the importance of long-term consumer relationships. It’s through this kind of omnichannel lens that enterprise chiefs need to see the potential of ARKit 2.0. If you use iOS 12 beta and go shopping at Shopify’s Magnolia webstore, you can already use Apple’s AR Quick Look tool to display 3D content in AR. To support this, Shopify is also using Apple’s recently announced USDZ specification, which makes it much easier to share objects in AR space. The company hopes to offer this service to retailers, who will be able to share items online (marked with an ARKit badge) that consumers can then choose to place in their homes using AR. That’s not confined to large items of furniture, either — any kind of object can be placed in this way — retailers just need to upload an image in USDZ format to their store. You’ve probably come across STM bags for computers and other electronic devices at some point. Earlier this year, the company introduced its own AR app (for iOS and Android) that lets consumers virtually try and configure one of its bags using their device. That’s very much what you’d expect from an AR app, but what is interesting about this attempt is the company’s claim that offering consumers the chance to explore products in this way has generated a 30 percent increase in online sales. It’s difficult to claim this kind of sales uplift would be enjoyed by any retailer, but certainly electronics consumers seem to like to use the tech. Is your enterprise focused on a similar early adopter vertical? Another B2C implementation that’s being explored is use of AR at live events. Virtex Arena is an app that lets fans at live gigs and sporting events compete in stadium-wide AR experiences. The idea behind this platform is that fans can have some fun in virtual space, but there must surely also be potential for brands to create and deliver immersive AR events in these space that help them make good and solid connections with consumers along fairly narrow demographics (sports fans, music listeners, and so on). There are some industries, particularly the heavy equipment industry, where it is impractical to bring demo units to customers for them to test. That’s where Showpad’s SaaS solution comes into its own. This lets heavy equipment vendors create functional (if virtual) AR models of their solutions that can then be demonstrated to potential clients in AR space. The idea is that sales teams can help their business customers explore how their solutions work, and how they might fit within existing premises and workflow. The approach has some clear advantages: Not only are sales teams always equipped with the capacity to demonstrate any product, but when they do, they can let customers get a real sense of how their solutions work, the company explains. That thing where you visit a shop to buy nuts and bolts and can’t remember which size you need? Or that moment when you realize there are now dozens of different light bulb designs to choose from, but you can’t quite pick the right one? These are everyday problems a new Amazon app solves, using ARKit and Amazon’s own app to make it easy for consumers to identify the part they need (more here). This is a useful app, but I’d argue that anyone involved in any form of enterprise — from carpeting to motor vehicle spares and beyond — should think about how to deploy this tech in their business. Not only does it make it much easier for customers to find what the need, but it’s a great way to constructively bridge the gap between business and customer and foster great relationships. 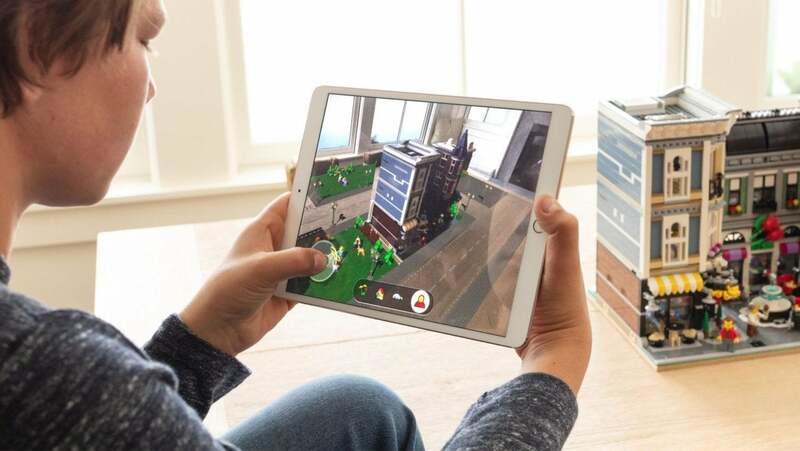 Apple and LEGO were justifiably proud to announced LEGO AR City at WWDC. This mixed virtual/real world game provides a series of puzzles and adventures built around physical LEGO objects. It’s a neat concept that opens up a whole host of branding, licensing, and entertainment possibilities. In doing so, it also shows how AR can be used to add value to everyday experiences. One great example I hope illustrates what I mean: Bulleit Bourbon worked with four outstanding tattoo artists to create a range of artistically designed collectible whisky bottles — that’s nice as far as it goes, but there’s also an AR component. Point your iPhone at the QR code to access an interactive AR experience. Of course, with implications in medicine, education, communication, and even air traffic control, it seems pretty clear AR tech is becoming something enterprises really must come to terms with as they seek to build customer relationships across both B2C and B2B markets. This rapidly growing business case is probably why the global virtual and augmented reality market should reach $142.4 billion by 2023, according to BCC Research.